This entry was posted in Portfolio and tagged RHDGF on June 5, 2015 by Alpha Vulture. 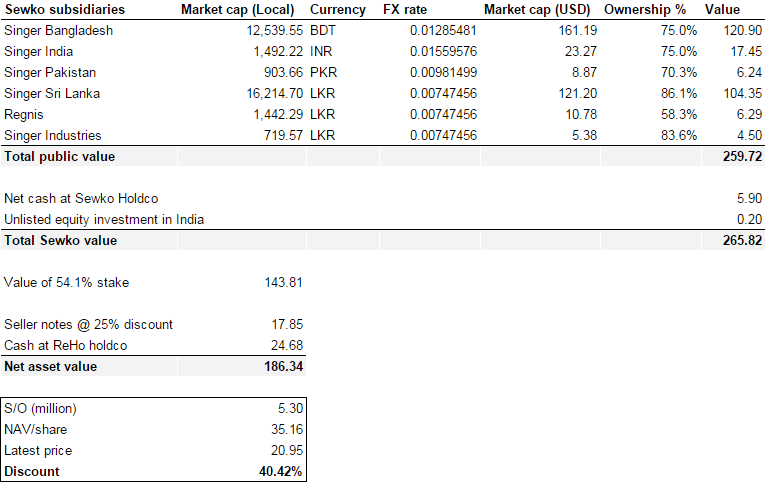 In your original thesis you had estimated the value for the Thailand business to be $68.95MM but in reality they only sold the 40% stake for $44.8MM. Seems like your estimates might be too optimistic? Value isn’t a static number. Some of the subs increased in value, some lost value; that’s life. Singer Thailand sold for close to quoted market value which actually makes me more comfortable. The thing bugging me about Retail Holdings is that it may be the wrong side of the trade – maybe the subs are overvalued. Even with the NAV discount, ReHo is 16.5x 2014 earnings – for department store retail which is a dying industry in developed markets and I’d imagine this will happen at some point in developing markets. The other thing is that over the last 5 years, while revenue has grown greatly, profit margins have become much slimmer over this time and ReHo’s portion of the consolidated net earnings has been shrinking. I don’t quite understand what’s going on here. I do see some disposals since 2010 – Singer India went from 80% to 75%, Thailand went from 48.5% to 40% (before this week’s sale), Sri Lanka went down about 1%. Also Sewko ownership went from 56.2% to 54.1% (warrant exercise by Sewco CEO). But this doesn’t quite add up to the drop in proportion of earnings to owners. In 2010/2011 it was 46%/56%. 2014 showed only 34% of net profits going to ReHo owners and the rest to non-controlling interests. Is it that the subs with least ownership are performing best? Some overhead at holding company level? Any thoughts would be appreciated here. I think that the subs with the least ownership are performing best, but I haven’t tried to reconcile all those figures. Guess things will change again materially after the Singer Thailand sale is reflected in the financial statements, since that was the sub with the lowest level of ownership. I’m by the way not very worried about investing in a dying industry. I think the developing world is sufficiently different with regards to demographics, infrastructure and other factors that you cannot really expect that what is happening in the developed world will happen in the developing world as well. Sure, in 10 or 20 years time things are probably going to be very different. But I think that’s the case for almost every company. I have a great deal of experience with retail specially in very emerging markets where RHDGF operates such as Sri Lanka, India, Bangladesh, Pakistan and Thailand. The issue is not the internet affecting retail as in the developed markets but the level of other retail competitors. In Thailand I was relieved to see the sale as this is the most retail competitive market where RHDGF operates. If you notice the competitive advantage in Thailand was credit and rural presence. In the bigger cities Singer was not a factor. Long term you could see retail competitors moving into the rural areas. In Sri Lanka and in Bangladesh the barrier to entry for other competitors is much more difficult. Singer has the better locations, many years of doing business, and a very integrated credit/retail model. Moving to a multi-brand model rather than just selling Singer branded products has helped tremendously. I expect these two businesses to thrive. However, the issue in these markets is the macro economic/political situation. Stability will produce good results. Pakistan is a very small business and would not surprise me if this is closed. India has great potential as the brand has very high value and moving to a wholesale business model with electronics and white goods branded Singer holds very good prospects. Going to a retail model would not work as this sector is becoming very first world. In short Singer should float these companies in their local markets or sell it to local investors. No one is going to buy the whole company as there are no synergies. Not sure why the company has not done this already but glad the Thai business was sold. I have a couple bond related questions. What is your bond/stock split? Are you buying individual bonds in a bond ladder? Any bond ETFs you recommend ? What is singer’s cost basis in its subs? Does your NAV calculation include any potential tax liabilities they would face from divesting their holdings? I don’t think they face any meaningful tax liabilities since as a Dutch NV they don’t have to pay any capital gains taxes on qualifying subsidiaries. This is confirmed in the financials by the lack of large deferred tax liabilities.